Rory Bosio, from Soda Springs, just won the prestigious Ultra-Trail du Mont-Blanc ultramarathon in a record breaking 22 hours, 37 minutes, and 26 seconds. The du Mont-Blanc is widely regarded as the most difficult running race in Europe. Bosio is the first woman to break the 24 hour mark. The second place woman was Nuria Picas Albets, with a time of 24 hours, 32 minutes and 20 seconds. Bosio finished seventh overall in this 166K trail race, sponsored by North Face. The loop course is in the Alps, near the borders of France, Switzerland, and Italy. The race starts and ends in Chamonix Mont-Blanc. There were 2,469 starters this year, 223 of them were female. The time limit for the race is 46 hours. Bosio went to France 6 weeks early to prepare for this race. She was able to train on the course and become familiar with the terrain. She runs “80-100 miles a week” and is sponsored by North Face. 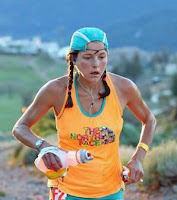 Bosio was fifth woman at Western States 100 mile Endurance Run (Squaw to Auburn) this year with a time of 19 hours and 52 minutes.